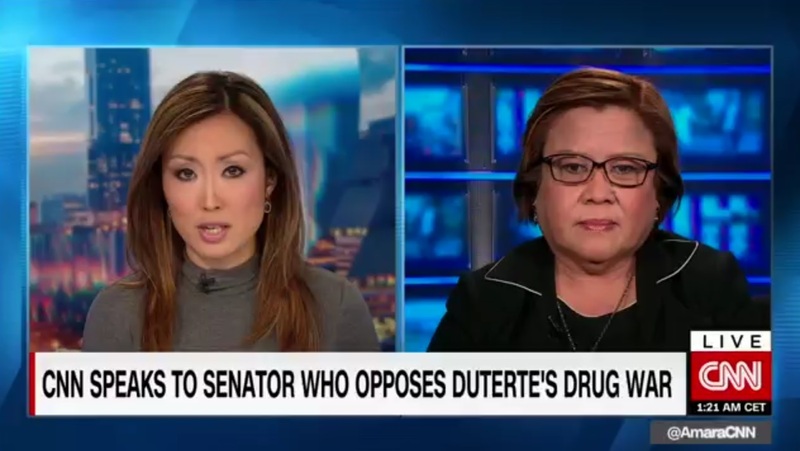 Embattled Senator Leila De Lima told CNN International Thursday that President Rodrigo Duterte should be impeached after openly admitting to personally killing drug suspects when he was still the mayor of Davao. Appearing on CNN Today, De Lima said Duterte's comments are comparable to an admission of "mass murder" -- a "culpable violation of the Constitution." “We do have an unfit President. He just confessed to doing the killing of people in Davao, and we know that he’s the one promoting and encouraging and tolerating these killings and therefore, that is an impeachable offense,” she added. Duterte on Monday said that back when he was still the mayor of Davao, he would join police operations to "personally" kill criminals, adding that he would purposely patrol the streets to look "for an encounter so I could kill." De Lima, who has been one of the leading voices against Duterte's war on drugs, recently flew to the U.S. after being named one of the 100 Foreign Policy Global Thinkers in 2016, along with outgoing UN Secretary General Ban Ki-Moon, 2016 U.S presidential candidate Hillary Clinton, and Canadian Prime Minister Justin Trudeau, among others. "I have no intention at all to escape," she said, assuring the Filipino people that she would face the barrage of cases filed against her. "I have to face it because my conscience is clear. These are fabricated, fabricated accusations and that's why I'm not afraid to face those charges."